This tasty sauce, made from chopped salad vegetables is a colourful way to enjoy a wide range of staple foods with vegetables. Some people even call it Salad Stew. 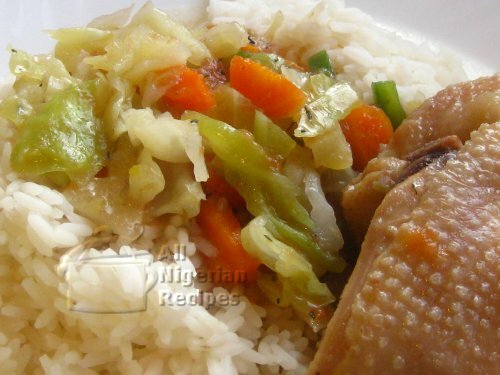 Eat it with white rice, boiled yam, fried plantain or even mashed potatoes. It is very rich in vitamins and nutrients. So there is no reason why you should not be cooking this recipe as soon as possible. I promise you'll not want to eat the Nigerian Red Stew ever again after eating this vegetable sauce. 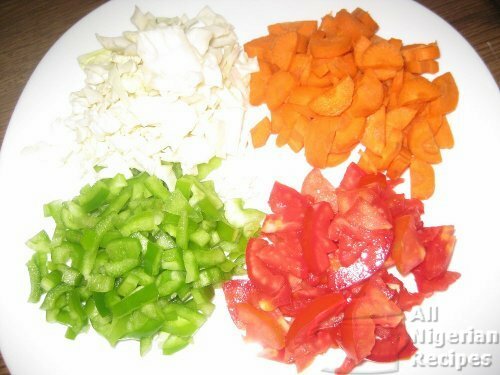 Wash and cut the vegetables: plum tomatoes (remember to remove the seeds), carrots, cabbage and bell pepper as shown. Remember to scrape the carrots before cutting. Set these aside. Peel the Irish potatoes, wash and cut into small pieces. Blend into a thick paste and set aside. This will be used as thickener for the Vegetable Sauce. Wash and cut the whole chicken into pieces. Place in a pot, add chopped spring onions, stock cubes and thyme. Add water to cover the contents of the pot and start cooking. When done, add salt to taste and top up the water to the same level as the contents if necessary. Once it boils, add the chopped tomatoes and the vegetable oil. Cover and cook for 15 minutes. Add the carrots and cook for 5 minutes. Now, add the potato puree, chopped bell peppers and cabbage. Stir, cover and allow to cook for 5 minutes on high heat. Add salt to taste and the sauce is ready to be served. Note: Feel free to experiment by varying the thickness of the vegetable sauce. This you can achieve by increasing or decreasing the amount of potato puree added till you get a consistency that appeals to you. 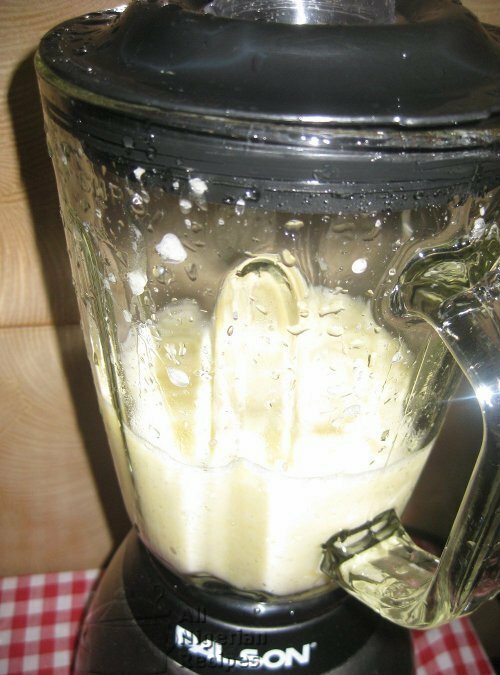 Tip: The smoothest puree usually settles at the bottom so you may want to use only that (if it is sufficient) and discard the frothy part at the top. Serve with white rice, boiled yam, fried plantain or mashed potatoes.